THE ESSENTIAL OYSTER. The latest and greatest. A GEOGRAPHY OF OYSTERS. The book that launched a subculture. Considered one of the great sensual foods since the time of ancient Rome, eaten in North America since its earliest human habitation, oysters are now seeing an American renaissance. In this passionate, playful, and indispensable guide, longtime oyster aficionado Rowan Jacobsen takes readers on a delectable tour of the oysters of North America. 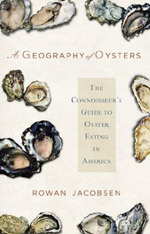 Region by region, he describes each oyster’s appearance, flavor, origin, and availability, as well as explaining how oysters grow, how to shuck them without losing a finger, how to pair them with wine (not to mention beer), and why they’re one of the only kinds of farmed seafood that are actually good for the earth as well as good for you. Packed with fabulous oyster recipes, maps, photos, and a color guide, plus lists of top oyster restaurants, producers, and festivals, A Geography of Oysters is both delightful reading and the guide that oyster lovers of all kinds have been waiting for.